A common mistake that businesses make is thinking that fulfilling an order should basically be the end of their interaction with a customer. In reality, shipping a customer's order is a great opportunity to continue building a relationship with them. Every existing customer has the potential to refer you to at least one new customer. One of the ways you can increase the odds that they’ll do just that is to strengthen your relationship with them. In addition to providing great service and quality products, adding extra touches like putting a couple of stickers in the box you use for shipping is a great way to ensure customers think positively of you and remember the name of your business when someone brings up the type of products that you sell. Selling tees is NOT easy and it takes a combination of both on and offline marketing to be successful. You also need to create and build up your brand so that people become familiar with your line. Branding is a very important aspect of the fashion industry. Many companies effectively use stickers to push and promote their brand image. You see logo stickers everywhere – on the backs of cars, on bulletin boards, on lamp posts, and certainly on consumer products and packaging. Stickers can be thought of as mini billboards, giving people an opportunity to take notice of your logo or slogan outside of the usual context, giving your company more top-of-mind awareness. People enjoy supporting brands they love and stickers are a great way to create a guerrilla marketing team out of your loyal customers and if they are done right they are much more likely to end up on laptop or cubicle wall then a business card. Basic branding on your order materials is sometimes neglected but goes a long way to make a great first impression to consumers. The key is to design a sticker that appeals to your customer base. Simply stating your business’s name and phone number won’t be very compelling. A better approach is to think up a clever image, witty pun or funny phrase that catches the eye and gets your message across. Use a single line in an easy-to-read font. Include your logo on the sticker to provide instant brand recognition. If you’re short on inspiration, visit a public parking lot. You’ll see many examples of the sorts of stickers your customers might find appealing. It is important not to put too much information into your promotional stickers because you want people to see it and read it at a glance, but you also have to make sure that you effectively promote your business at the same time. There are many online sticker printers that are very reasonably priced and offer tons of sizes and shapes. Be creative and have fun, your customers will take notice the next time they receive a package from you and get their new stickers! Check out Sticker Mule, Sticker Giant or Stickerobot. Of course you can hand out your brand's stickers to people you meet or have available at any events where you are promoting your brand. 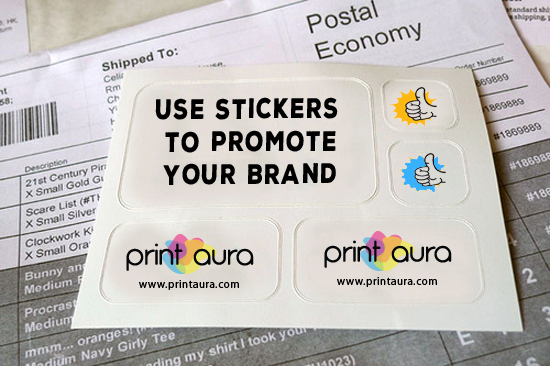 You can also add stickers to your shipments of t-shirts as a freebie, this is a service which Print Aura offers for a nominal fee. When your customer opens up the package of the t-shirt they ordered they should be delighted to find the free sticker featuring your brand. Who knows where your sticker may end up and how many 100s or 1000s of people may see your branded stickers.